NOTE: You are purchasing a standalone product; MasteringChemistry does not come packaged with this content If you would like to purchase MasteringChemistry search for ISBN-10:03219669291/ISBN-13: 9780321966926. That package includes ISBN-10: 0133858413/ISBN-13: 9780133858419 and ISBN-10: 0321967461/ISBN-13: 9780321967466. General, Organic, and Biological chemistry (2-semester). Give allied health students the chemistry they need…how and when they need it! 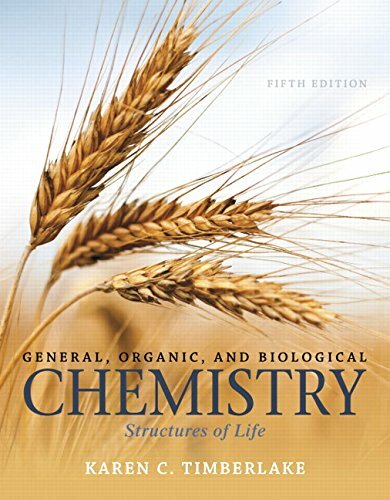 Designed to prepare students for health-related careers, General, Organic, and Biological Chemistry: Structures of Life breaks chemical concepts and problem solving into clear, manageable pieces, ensuring students follow along and stay motivated throughout their first, and often only, chemistry course. Karen Timberlake’s friendly writing style, student focus, vetted and refined clinical chemistry problems, and engaging health-related applications help today’s students make connections between chemistry and their intended careers as they develop the problem-solving skills they’ll need beyond the classroom. The Fifth Edition fully integrates the text with MasteringChemistry to provide an interactive and engaging experience. New Construct a Concept Map activities help students connect ideas through video solutions and live demonstrations, while the text and media establish a clinical focus that ties chemistry directly to allied health. Instructors can also assign MasteringChemistry’s new Dynamic Study Modules, which enable students to remediate core math and chemistry skills outside of class, freeing professors to focus on GOB Chemistry concepts and problem solving during class.